If it is hard for the average citizen to realize the prodigious powers of a really strong man, it is harder for him to understand where that power comes from. Take, for example, when the late Louis Cyr, as a young man, actually pushed a loaded freight-car, single-handed, for a few yards up a slight grade. Tell that to the average man and he will at once say "Wow ! Why, it would take a dozen ordinary men to do that" ; and so he comes to the conclusion that the mighty Louis had the strength of twelve, which sounds just like the marvelous stories about the old-time heroes. The explanation is, that freight-cars were smaller thirty years ago, and that Cyr knew just how to apply his strength. At that it would have taken about four ordinary strong workmen to do any of Cyr's most famous stunts. How much can the ordinary workman "muscle out?" About 35 pounds. Cyr muscled out 135 pounds. How much can the ordinary workman lift off the ground if he leans over and picks up the object with his hands? 300, 350 or some cases 400 pounds. Cyr lifted around 1800 in that style. Perhaps Cyr is no fair basis for comparison, for he inherited tremendous strength, and added to that strength by practice and training, and no one, born on this side of the ocean in the last hundred years, has been able to do the things that Cyr did. It must be remembered that Cyr, when in condition, weighed over 300 pounds himself and that he had the body of a giant, even if he was less that six feet tall. Some of our best known "Strong Men" are by no means gigantic. The bigger ones average around five feet ten inches in height and weigh anywhere from 185 to 225 pounds -- all bone and muscle. No heavier, you see, than many boxers, and not as heavy as lots of those big beefy wrestlers. There are quite a group of "Strong Men" who stand 5 feet 4, or 5 feet six inches and who weigh from 140 to 165 pounds. Add to that the fact that the vast majority of modern "Strong Men" are "self-made" and you will see that there is a chance for anyone to become strong, no matter what handicap nature has imposed in the way of lack of height, small bones or slender frame. When you think of the diminutive Oscar Matthes at one end of the scale, and the gigantic Cyr at the other, and all the others of various heights, weights, and shapes between the two, it should convince you that you have a chance. You probably never could get as big and strong as Cyr; in fact you would not want his clumsy build, but you can do as much for yourself as Mr. Matthes did; if you can equal his interest and persistence. 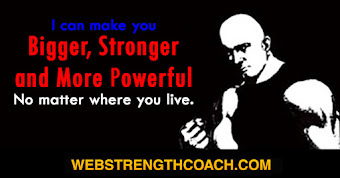 The general public knows little about strength, either how to get it or how to use it. Furthermore the dear public is a rotten judge of strength. 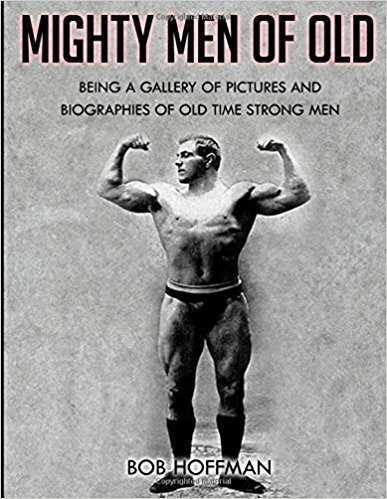 The average boy of eighteen or nineteen will judge all "Strong Men" and strength-records by the feats of his favorite hero in fiction - perhaps after the hero of some widely-read books, who performs feats that no human being ever did or could do. If he has ever seen a real "Strong Man" in the flesh, it has been at the circus or across the footlights. As the stunts of his fiction hero have enlarged his bump of credulity he is prepared to believe the actual "Strong Man" can do anything; which makes it easy for the very, very few fakers in the business to earn a false reputation for superhuman strength. Why, I have had men come and ask me if could lift 2000 pounds with my teeth; and when I assured them that I could lift only a small fraction of a ton in that way, they would say, "Oh, then I guess you are not as strong as So-and-So. He says he can do it." 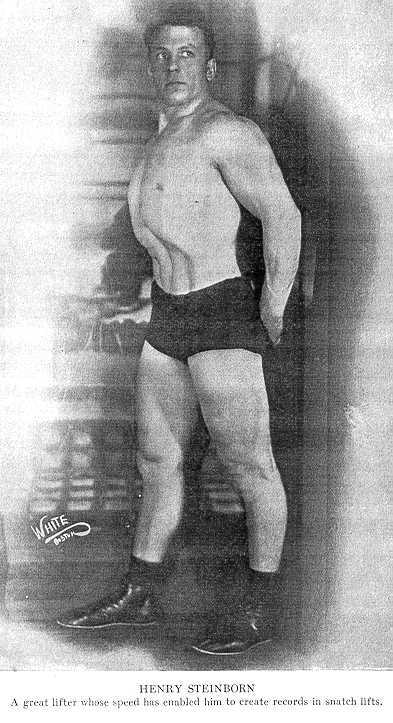 Contrasted to that, there are the confirmed skeptics who hold that all feats of strength are accomplished through trickery, and that no on man is very much stronger than others; and that is unfair to the dozens of "Strong Men" who give exhibitions of great muscular strength, and to the hundreds of amateurs who could give similar exhibitions if they wished to. It is surprising how many there are who think that because they have never seen anyone handle a dumb-bell heavier that 50 pounds, then to put up 100 pounds is as much as anyone can do. Now if such a man asked any professional, or any fairly good amateur, "Can you put up 100 pounds with one hand?" the athlete would have regarded him as a curiosity, and would have answered, "Of course I can." And if the doubter demanded proof, the "Strong Man" would take a "hundred-pounder," and after he swung to the shoulder, "put it up" not once, but half a dozen times. 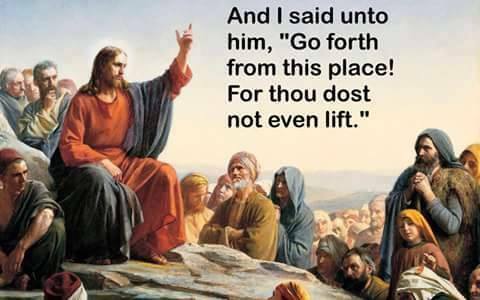 And all the time he would think his visitor was "kidding him," for to ask a "Strong Man" whether he can manage 100 in an overhead lift, is something like asking a "ten-second man" whether he can run 100 yards in 15 seconds. Having seen it done, the visitor insists on seeing the bell weighed. Being finally convinced, he then says, "Did you ever see a man lift 500 pounds off the ground?" To forestall any further questions the athlete gets together a bunch of weights, and using the "hand-and-thigh" style, lifts the mass an inch from the ground. Then he insists that the visitor weigh the stuff. So the poor chap has to lug all the different weights to the scale and when the reading shows not 500 but 1000 pounds, he can scarcely believe his eyes. But before he does he has one more request, which is, "Would you mind letting me feel your arm." So the very much bored athlete obliges by flexing his sixteen-inch biceps, and offering it for inspection. Like as not the next time strength happens to come into the conversation, that particular visitor will come out with, "Say, not long ago I saw a fellow lift 1000 pounds off the floor. Gee! You ought to see the arm on him." To the uninitiated, the arm is the only thing that counts. They fail to note the interlocking chain of superb muscles, which give bodily strength; nor do they ever take into account the great internal driving force which the true "Strong Man" possesses. Let us take the last story as a lesson, and see if I can show you what the visitor should have seen, and could have learned from his interview with the "Strong Man." If he had been wise he would have asked to inspect not the arm alone, but he shoulder also. It takes more than just a strong arm to "put up" a 100-pound dumb-bell; just as it takes more than a strong arm to do a "one-arm chin." At first thought, all that seems necessary is that the arm be straightened; whereas in addition to that the whole arm has to be thrust upward. The muscles which straighten the arm are the triceps, which are on the back of the upper arm opposite the biceps (which bends the arm). If, when standing with the weight at the shoulder, you flexed only the triceps muscle, the arm would be straightened downwards. Since the weight has to travel upwards, the elbow must be lifted away from the body and upwards, until it is on a level with the top of the head. This lifting of the arm is accomplished not by the triceps, but by the big deltoid muscle; which is like a triangle with its broad base fastened to the bones of the shoulder, and its apex or point, fastened half-way down the bone of the upper arm. At the start of the "push-up," most of the work is done by the deltoid, and smaller part by the triceps. In the latter half of the lift, when the arm is coming to full stretch aloft, the triceps takes on the major part of the work. Therefore, an examination would have disclosed that the athlete had, covering the point of his shoulder, a grandly developed deltoid muscle which would have impressed an expert even more than the wonderful development of the upper arm itself. After the athlete had lifted the thousand pounds from the floor, the visitor could have learned more if he had inspected the muscles of the upper back, the forearms and the thighs, than he could by feeling the upper arm. For in the "hand-and-thigh" style which the lifter employed, the raising of the weight is accomplished by a powerful straightening of the legs and a strong upward shrug of the shoulders. If the lifter happened to be in exhibition costume, his visitor would hardly have failed to see that he had unusually large and shapely thighs, particularly at their upper parts where they are joined to the hips. But he might not have noticed that just as the weight left the floor, two immense masses of muscle appeared on the top of the athlete's back, just below the base of the neck. To the novice it appears as though all one had to do would be to stand erect and lift the weight by bending the arms, so that the elbows moved outward and upward. In actuality the hands are moved upward an inch or so by lifting, or shrugging, the shoulders. The arms are scarcely bent at the elbows, but nevertheless there is a great pull on the arm muscles. By starting with the legs only slightly bent, and then straightening them, the athlete has elevated the whole body, and so long as he can keep his body upright and his shoulder muscle taut, the weight has to come up. If he had stood upright and tried to lift the weight just by bending his arms, all he could have raised would be two or three hundred pounds; whereas by employing the bigger and more powerful muscles of this thighs and shoulders, he can lift four or five times as much. Since this a stunt of "general strength"--one which required many muscles to work in unison-- I am going to improve the occasion by still further analyzing the action of the muscles used. If you could see a photograph of an athlete lifting one thousand pounds in this manner, you would notice muscles sticking out all over him, and perhaps the most evident would be the big arm muscles; and you might conclude that I was all wrong when I said that the arms had but a small part of the actual lifting. The forearm muscles naturally stand out in cords and bands, for it takes great gripping power to keep the fingers clenched when 1000 pounds is lifted. The upper-arm muscles stand out, not under lifting strain, but the holding strain. Remember that 500 is hung from the end of each arm, and that weight is sufficient to pull the bone of the forearm loose from the bone of the upper arm bone; and would do so unless the strongly flexed muscles, and rigid tendons held the joint together. The muscles along the full length of the spine also stand out prominently, not because they do much of the lifting, but because they have to keep the body upright. The muscles which stand out most prominently of all are the ones which are doing the actual lifting; namely, the thighs and shoulder-muscles. Let's do some more analysis, this time studying the "dip" on the parallel-bars. A strength-seeker wishes to develop the triceps muscles, which straighten the arms, and is told all that is necessary is to practice "dipping" on the parallels. The idea being that since the triceps straighten the arms, and as in dipping the body is lifted by straightening the arms, the performance of the act will develop the muscles used. Which is perfectly true, so far as it goes. "Dipping" is one of the grandest triceps-developers, although while it adds bulk and strength to most of the triceps muscle, it leaves a smaller part in a partly developed state. My point is that "dipping" develops other muscles even more than it develops the triceps. In doing the feat, first you mount the bars, one hand on each bar, arms unbent, and body straight up and down. All your weight is supported on your hands. 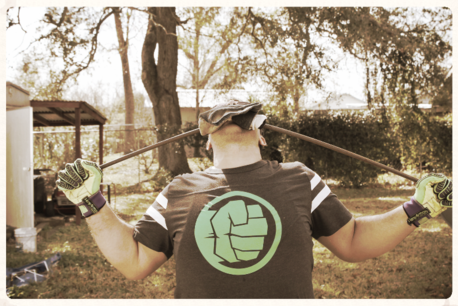 Now you bend the arms at the elbows and allow your body to sink vertically downwards between the bars. This brings your armpits down close to your hands, and makes your elbows stick upwards and backwards. This position stretches the breast muscles; in fact, stretches them so violently that for a man who has thin, weak breast muscles the position is actually painful. The next thing to do is to raise from the dip; to push yourself up again. To effect this, you push against the bars with your hands just as hard as you can. But in order to get back to the first position the elbows have to be brought close to the sides of the body. That is done not by the action of the triceps, but principally by the breast-muscles. As in the case of the deltoids the pectoral are roughly triangular in shape, with their bases attached, or anchored to, each side of the breast-bone, and their points to the upper arm-bones. (They have other anchorages on the collar-bone and ribs). The pectorals were stretched as the body was "dipped" or lowered. The upward motion is started by their power. As they contract they shorten and pull the upper arm even closer to the body. After the body is half-way up, the work of lifting is further taken over by the triceps. That is a brief and sketchy description, which leaves out a lot; because there other body-muscles which help the pectorals; and the triceps really work throughout the entire time the body is being lifted. At that this little exposition may serve to show you how in some cases the body-muscles do most of the work in what appears to be a feat of arm-strength. 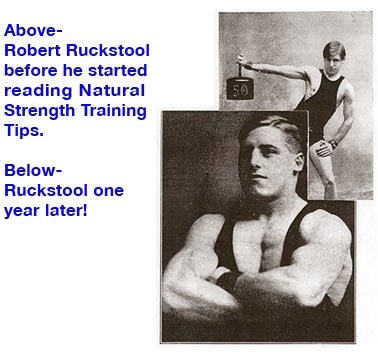 I have spent considerable time in showing people how to get strength and development by using chest-expanders; a devise consisting of two handles connected by steel springs, or rubber-cables. If a pupil asked me to give him an exercise that would develop only the triceps, I would have to tell him to proceed in this manner. To hold the expander loosely across his chest; hold the upper arms out horizontally to the sides so that the elbows pointed straight out; and then to stretch the expander by straightening his arms. Since the upper arms are held still, the cables are stretched by moving the forearms only; and practically all the work would be done by the triceps, which by their contraction would bring the forearms into line with the upper arms. But that would be a particularly poor exercise, for it would make the triceps work separately, instead of in conjunction with other muscles. So I prefer to hold the expander across the chest with the elbows close to the body, and the hands near the shoulders; and then to stretch the cables by pushing the hands out straight to the sides, and extending the arms as I straighten them. For that develops not only the triceps, but all the shoulder and upper-body muscles, which move the arm away from the body; the muscles you would use in "putting the shot," or in striking a hard blow with your fist. Let us consider a feat of strength which involves the use of the arm-muscles and of the body-muscles which control the arms. As for example, the gymnastic stunt known as "The Cross." This is performed on a pair of swinging-rings. The whole weight of the body is on the hands. The arms are stretched out to either side and the body hangs almost upright. So the body forms the upright bar of the cross, and the arms which are rigidly straight, from the cross-bar. This is really a terrific feat of strength, which brings into play almost every muscle from the neck to the waist, and from hands to shoulders. To help you realize the strength required, let us suppose that a man weighing, say 150 pounds, would muscle out a 75-pound weight in each hand. Each bell would be half his own weight, and only a very strong man could hold the bells at arm-length. All his energy would be concentrated in keeping the two dumb-bells at the level of his shoulders; which would mean a violent contraction of the triceps muscles and a still more violent contraction on the part of the shoulder-muscles; and only particularly big and strong muscles could withstand the strain. When a gymnast does "The Cross," his problem is just the opposite; for his great effort is to keep his body from falling. So he presses against the rings with the palms of his hands, and presses so strongly that all the muscles on his arms and body stand out like steel bands. You see, his upper arms simply must be kept at right angles to this body. The arms themselves have no power to maintain the position, and so that power is furnished by a pair of big muscles called the latissimi, whose broad bases are anchored to the various bones of the lower back and whose points are attached to the upper-arm bones. When these muscles contract they pull, or keep, the arms close to the body; or draw them past the body. When doing "The Cross" these muscles hold the body up--or keep the arms level--whichever way you choose to put it. While the latissimi are working harder than any others, all the muscles are helping. We have seen that the breast-muscles and the shoulder-muscles also are anchored on the body, and attached to the arm-bones. So they have to contract and help keep the arms and body at right-angles to each other. The muscles of the upper arms and forearms flex themselves so as to keep the arms from bending at the elbow; a thing which requires a balance of forces and therefore application of power from both sides of the joint. The muscles of the upper arm itself cross the shoulder-joint and fasten to the body; and they help out. Therefore "The Cross" can be performed only by an athlete who is thoroughly and evenly developed, and who is particularly well-knit. A lack of size (and consequently of power) in any one set of muscles, would make it impossible for him to do "The Cross." One step further: This time a stunt that employs still more muscles. There is a feet known as "making a flag" of yourself. The gymnast stands alongside of a vertical pole; grasps it with one hand at the level of the hips, and with the other hand as high as he can comfortably reach; then he lifts his feet from the ground and stretches his legs and body out horizontally. The arms are almost but not quite straight. The body and legs form the flag blown out straight by the wind, and the arms are the ropes which fasten it to the flag-pole. Gymnasts take pride in doing this stunt "stylishly." They get the body and legs in one straight line, keep the legs pressed together, and "point their toes." What is more they hold the position for a couple of seconds without a perceptible quiver. If you have followed any line of argument in the other cases, you should be able to figure out for yourselves how "doing the flag" requires strong muscles on the arms, shoulders, breast , back--particularly on the sides--and in a lesser degree on the hips, and even the thighs. I could go on and on; for this kind of thing is one of my greatest interests. 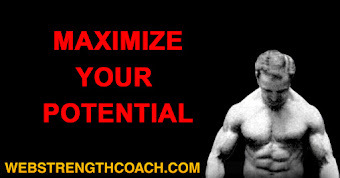 If I had the space I would analyze all sorts of strength-feats and show you how the muscles work. Earlier in the book I had to do it, to prove the combination of back and leg strength that was necessary to lie with head on one chair, feet on another, while supporting a great weight on the center of the body. 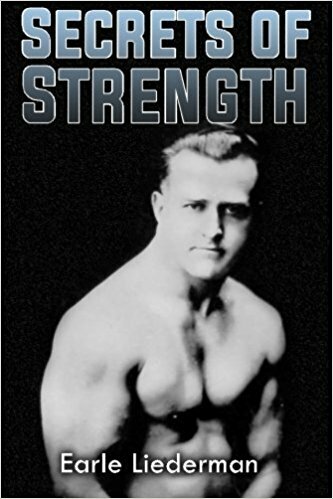 All the time I have been working in the hope of making you realize that great strength necessitates an all-round symmetrical development; that the whole body has to considered as a unit, and not as a lot of unrelated parts; and that a "Strong Man" must have great bodily strength instead of just local strength. There is a vast difference between a strong man and a man with strong arms. In your case --you, the strength-seeker -- it is my hope that you work on the lines I have suggested. Instead of working entirely for a strength of sinew, or just for large puffy muscles, why not plan your work so as to increase your bodily strength and build up your internal energy while covering your body with muscles which are at once of large size, great strength and high quality? That kind of muscle always is shapely and clean-cut. With such muscles, your body will be capable of lightning-like agility, or of tremendous power slowly applied. If you were to watch a professional at his practice, you would notice that when he was resting, his muscles, instead of being humped up, would be as smooth as your own. In fact, very much smoother. For your muscles are probably so think that your elbows and knees are knobby. Your collar-bone and shoulder-blades protrude, so that what muscles you have, have no seeming relation to each other and are widely-spaced. 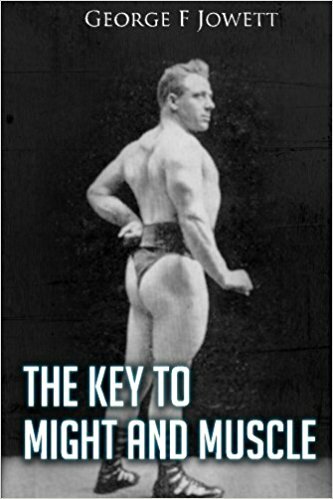 Whereas, the "Strong Man" having every muscle developed, has long sweeping curves. His body muscles are like low-lying hills, melting into each other; and his arms and legs are far rounder than yours. His arms are joined to his body in such a way that in certain positions the muscles seem to run in one unbroken sweep from his elbow all the way to the base of the neck, or to the breast-bone. As for collar-bones and shoulder-blades, you know he has them but they never make themselves unpleasantly apparent. His great thighs merge right into his hips. If he happens to be half reclining on a couch, his body at the waist-line looks as round, and almost as smooth as, say, a telegraph pole. If he starts to sit up, then for an instant you get a glimpse of a flow of muscular ridges across the front of the abdominal muscles. The abdominal muscles got busy in the act of raising the body in a sitting position. He stands squarely on both feet and his legs have beautiful smooth contours like those on the limbs of a great dancer. He takes a step forward and instantly you see the play of the great muscles on the thigh, while at the finish of each stride a great mass of muscles appears in the back of the calf. Strong muscles have to have a certain firmness, for any flabbiness is a sign of poor condition. They should not be soft, and neither should they be hard to the touch. If you see a picture of a group of swimmers, more likely than not they will be shown seated on the sloping bank of a stream; and almost invariably they sit with their knees drawn up, and their hands clasped over their shins. Since they were extremely abbreviated garments, you can easily see the thighs. If you are a close observer you will note that in this position the thigh is flat along the top, and has a great curve along its under side, from the inner hinge of the knee to where it reaches the hip. Therefore, the thigh muscle is sagging of its own weight, which is possible only when the muscle is flexible and relaxed. Photograph them standing on their feet and most of the muscle would show on the front of the thighs. 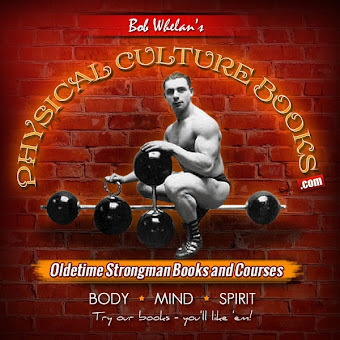 I have often seen a bunch of "Strong Men" sitting in the position described, and have remarked that their thigh-muscles sag just as much, and just in the say way as do a swimmer's thigh-muscles. There is nothing unnatural or dangerous about a muscle being iron-hard when in action. Stand on your tip-toes, high as you can! Reach down and place your hand on the calf of your leg. Wow! Hard as iron, isn't it? Didn't know you had such a muscle, did you? Next, sit at a table so that your feet won't touch the floor. Now feel the muscles of the calf. Utterly relaxed and soft. That is all there is to it. It is possible for a man to exercise every day in the year, and for years on end, without ever getting strong; that is, what I call strong. In all that time he has been on the wrong track, and has done none of the things that create strength. He has spent enough time at his exercise to have become a wonder. What he lacked was knowledge. His principal error has been to develop the muscles singly instead of in groups. His second, that almost all his exercises have been aimed at developing a few parts of his body; probably his biceps, the front of his thighs and his abdominal muscles. Thirdly, he has never realized that muscles have to be nourished, as well as exercised. Lastly, because he has no idea of creating reserve-energy. Many is the time some young chap has said to me, "Mr. Liederman, why is it that I cannot get stronger? I exercise an hour at a time and I never miss a day. And I always work until my muscles are thoroughly tired." If your have read the preceding chapters you know why he made no progress. After all the great trouble is that beginners will rarely take the trouble to become acquainted with the names and functions of their own muscles. Some of them know only the "biceps" by name; and the vast majority cannot -- to save their lives -- name a dozen separate muscles and tell what they do. Consequently, it is no wonder that they have a partial or an uneven development. If one doesn't know how the different muscles work, how can one devise exercises to develop those muscles? One time I took a friend of mine witness the training of a "Strong Man." It was necessary for the athlete to shift a big " pyramid weight," so that we could find a seat. And he shifted it a foot to one side with an almost imperceptible movement. Said my friend, "Say! How much does that weigh?" He was told "350 pounds," and then to me, "But, Earle, he did not lean over or seem to use his arm very much. How did he do it?" I replied, "After he took hold with his hand he shrugged his right shoulder as to lift the weight a hair's breath, and then he slid it along the bench. It isn't hard if you have strong trapezius muscles." Further conversation proved that my friend had never heard of those muscles; had no idea where they were located; or what they did. So I had the athlete stand with his back towards us, and first shrug the shoulders, and then press the shoulder-blades towards each other; with the result that the trapezius stood out in masses. And then I had to further explain that, "No, those muscles were not unnatural." "That everybody had them, but usually in an underdeveloped state." "That he could develop his trapezius muscles by doing certain things, and so on and so on." He was not a bit worse than many others. I have seen earnest workers spend ten minutes working their upper-arm muscles and not ten seconds at their deltoids. Men who would do unending exercises for the muscles on the front of the thighs, and not one exercise for the muscles on the rear part of their thighs. Others who spent a lot of trouble in building up their abdominal muscles (stomach muscles, they called them), and never one thing to strengthen the vastly important muscles that compose the buttocks. Is it any wonder that strength is a thing that always eludes them? When they do not even know that throwing and striking power does not come from big arm muscles, but from the power of the body-muscles that move the arm! Or that the legs can exert much more power if the hip-muscles are properly developed. Unless a man knows something about the interdependence (not independence) of the muscles, he is little likely ever to get a symmetrically built body. It is my experience that symmetry is most easily acquired by means of general exercises, which use the muscles in groups, than by purely local exercises. There is still another way in which ignorance of anatomy will handicap the man who is strong for a maximum development. In speaking of the upper arm, I mentioned only two muscles; the biceps which bends the arm and the triceps which straightens it. There are more muscles than that in the upper arm---smaller and less important ones--but you should know something about them, and occasionally try something else that the customary arm-exercise, so as to give development to these minor muscles. The same thing applies to other parts of the body, particularly to the legs. Some of the larger muscles are superficial, near the skin, and others are "deep-seated," that is, close to the bone, and under the other muscles. Sometimes a man will do an exercise that develops only the big superficial muscles, and fails to do other exercises which affect the under-muscles. As a result, the limb never attains its full size. If the deep-seated muscles are developed they push the superficial muscles outward, and thus add considerably to the size of the limb, and also improve its contours. The "road to strength" is not a particularly easy one to travel. It is something like the edge of a saw-blade. You go on nicely for a while, and then for a while you seem to stand still. Then you make another gain, followed by another period in which you seem to make no progress. The great thing is not to quit the first time you get stuck; but to see whether all that is necessary is to give nature a chance to catch up. Above all, and this is the last piece of advice, don't forget to build up your energy-reserve by the right kind of food, plenty of sleep, and avoidance of overexertion. It is possible to buy the chassis, say, of a Mack truck, and put a Ford engine in it; but although the chassis is massive enough to bear 5 tons of goods, the blamed engine won't pull them. You could get more mere work done by mounting a powerful engine on a light chassis, especially on an uphill road. But why not get all the results you can; strength of chassis plus great engine power? Make your body into sort of Locomobile, or Rolls Royce.